Groups up to 24 Persons (1 to 4 lanes) BOOK ONLINE ANY TIME! If you want a birthday party that really takes the cake, you’ve got to give it to Rowans in North London. Rowans is the perfect party pick for all sorts of birthdays. Whether it’s a big day for an eighteen year-old or a special fiftieth, Rowans adds up to a choice that combines fun, flexibility and full-on involvement for everyone who turns up. Or you may want a special place to hold that long awaited office party that’ll bring the department together. Where you can scatter those work hassles with a seriously fun bowling night out for work colleagues or student mates. With great music, fine food and a great atmosphere. After all, there’s nothing like a bowling alley to rack up the enjoyment. And Rowans in North London is right up there with the best of them. Big bowling for groups of 25-200 people at Rowans Bowling North London. 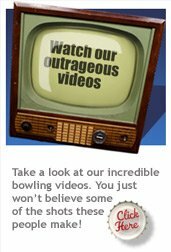 Thinking big at Rowans means we can handle North London bowling parties of up to 200 people, in one amazing superbowl session for your company bowling party, birthday or huge party event, charged at an hourly rate per lane. Remember, you can book 24 hours a day so you and friends can organise your bowling anytime you want. Just make your booking request online (24 hrs) or telephone our booking office on 020 8800 1950 (Mon-Fri 9.00am-5.00pm). 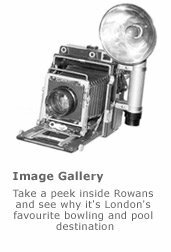 Or email info@rowans.co.uk.